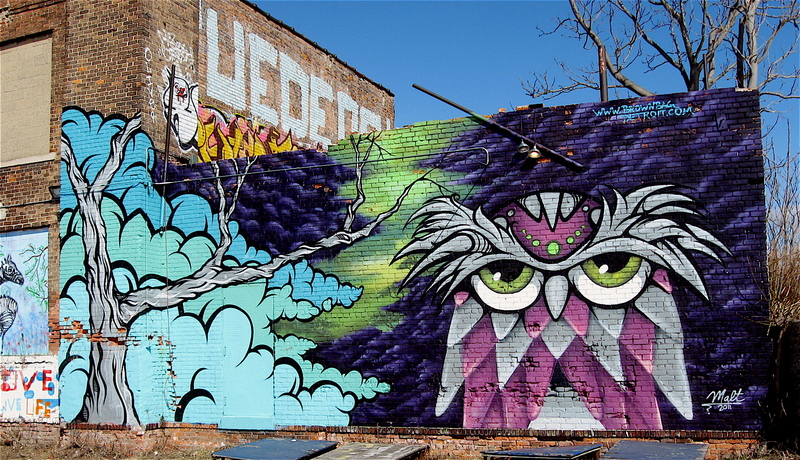 Over the years, Detroit’s Historic Eastern Market has been a hot spot of colorful wall murals. Much of their visual content builds on the market theme of fruits, vegetables and meats. 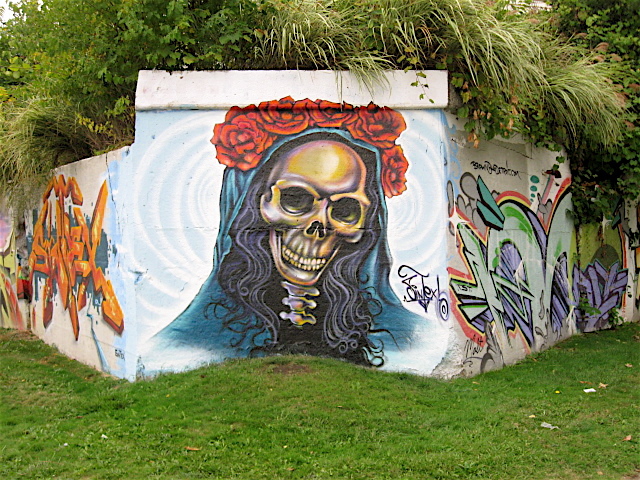 Others themes have been created by local and international street artists, and they feature a variety of strong graphic elements, dreamy caricatures and cartoonish looking characters. 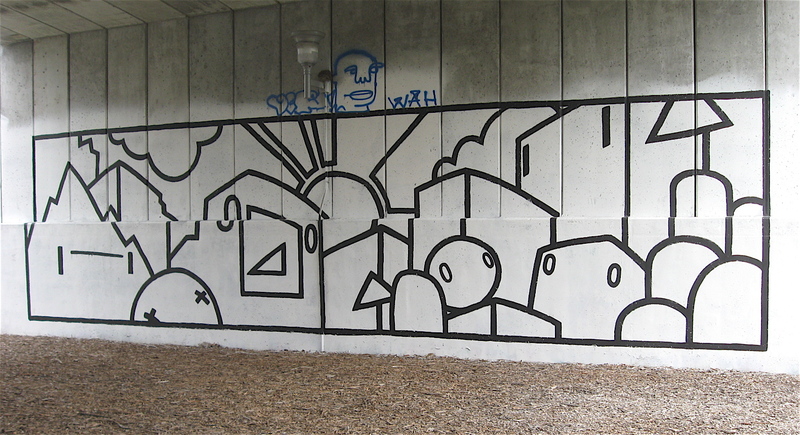 Also found on the walls are murals featuring highly stylized letters and striking abstract designs and illustrations. 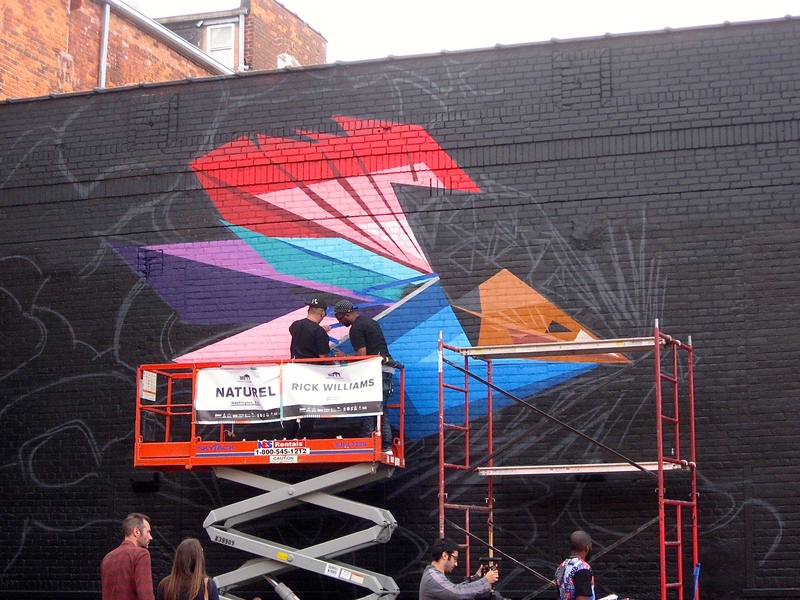 Building on the market’s rich heritage of street art, the Eastern Market Corporation (in conjunction with a local art gallery, various sponsors and partners) has created a week-long street art event called Murals in the Market. 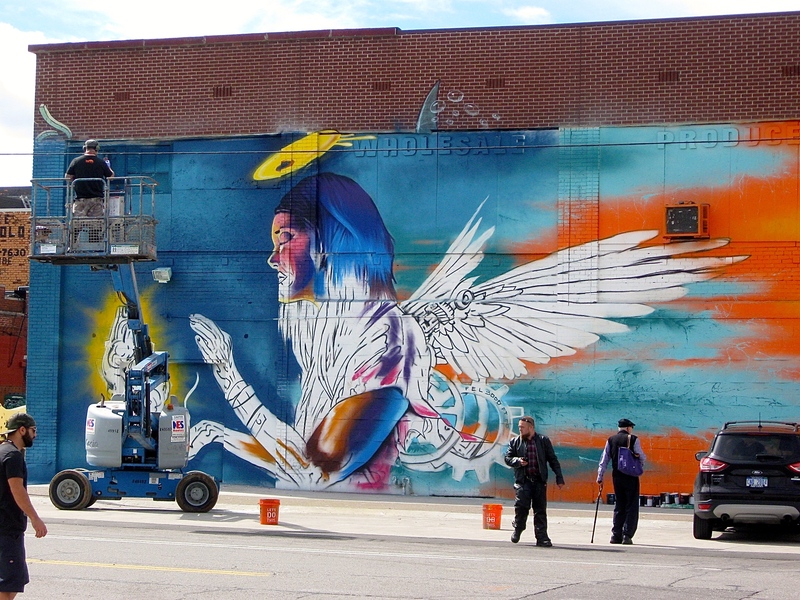 Over 45 Detroit, out-of-state and international street artists have been invited to paint murals in a range of styles on many of the buildings throughout the market. The event got under way on September 17th and runs through the 25th. 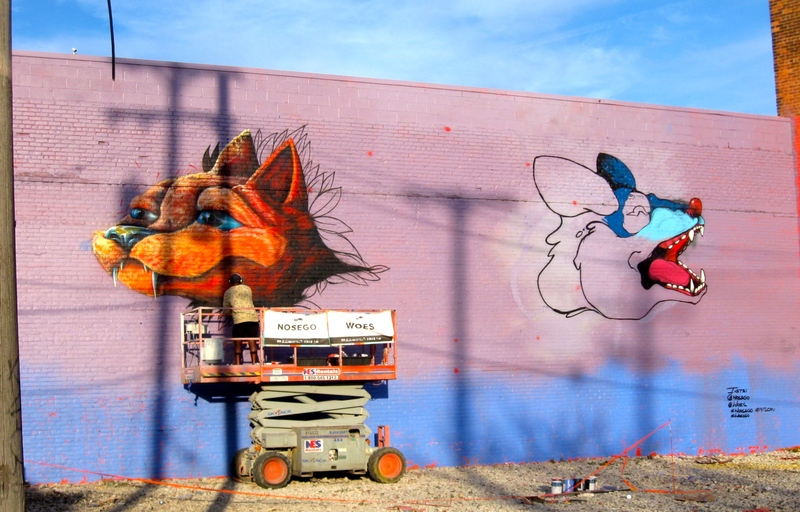 Below are a few early photos I took of some of the incomplete murals while riding throughout the market on my bicycle over the past weekend. 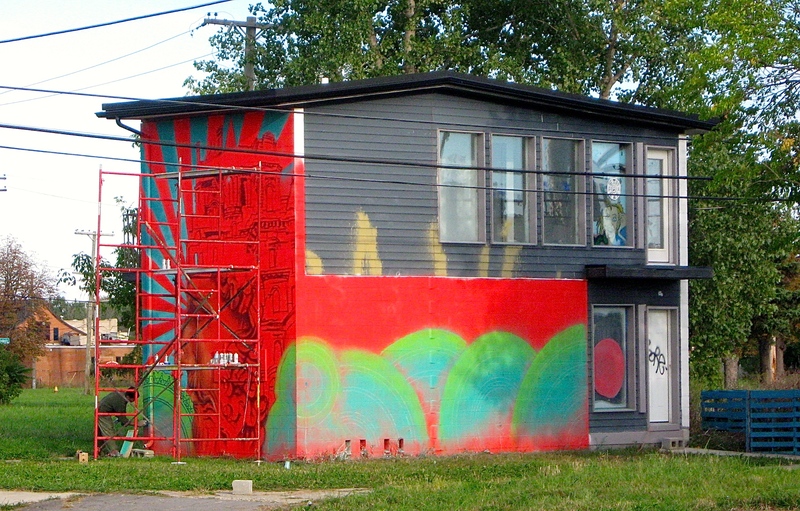 Many of the finished wall art pieces will soar 20 to 30 feet, and they’ll be at least that wide. Look for final images of the pieces featured below in an upcoming blog entry. 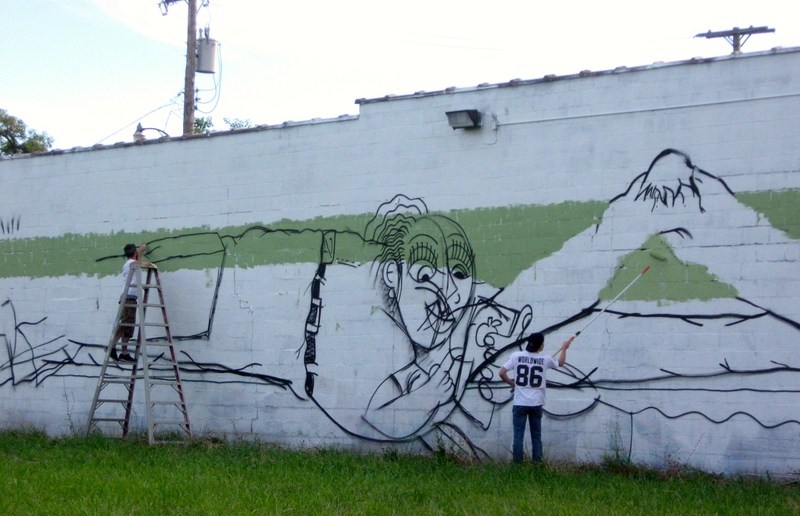 It was quite interesting to see how the artists worked the walls one small section at a time, and it will be exciting to see how their pieces evolve into the final stage. 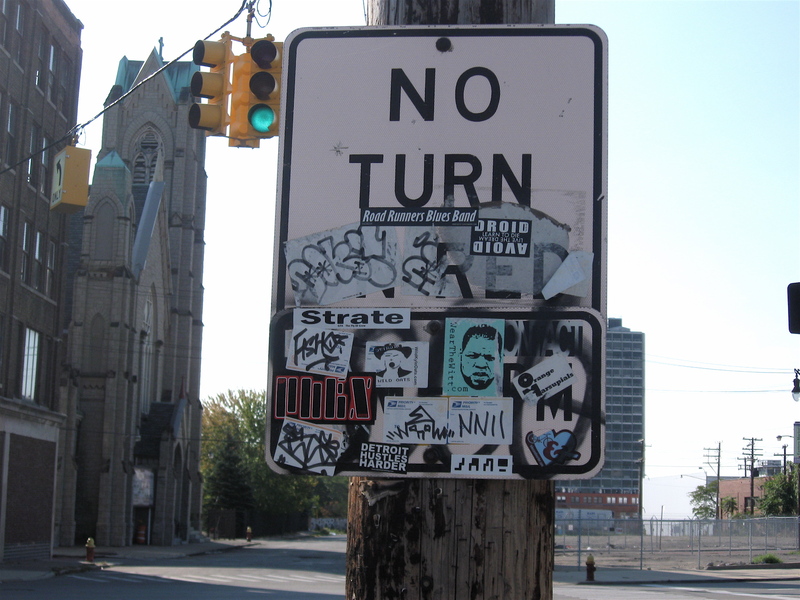 Detroit’s North End neighborhood is an interesting place full of history. 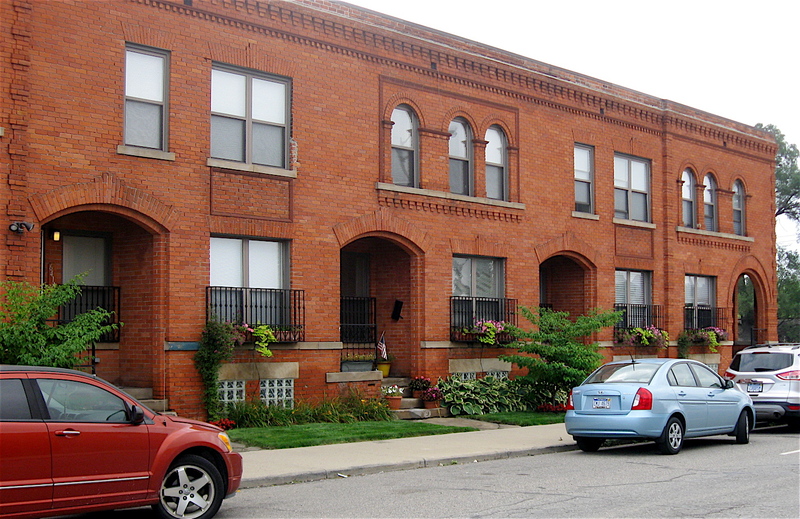 It’s an old section of the city where residential and industrial areas seem to intersect. It’s also a good-sized neighborhood that radiates about two miles around the intersection of East Grand Boulevard and Oakland Avenue. Bicycling through the streets of this old, historic neighborhood, I was struck by the contrast between the industrial area south of East Grand Blvd. and the farm like feel north of the Blvd. 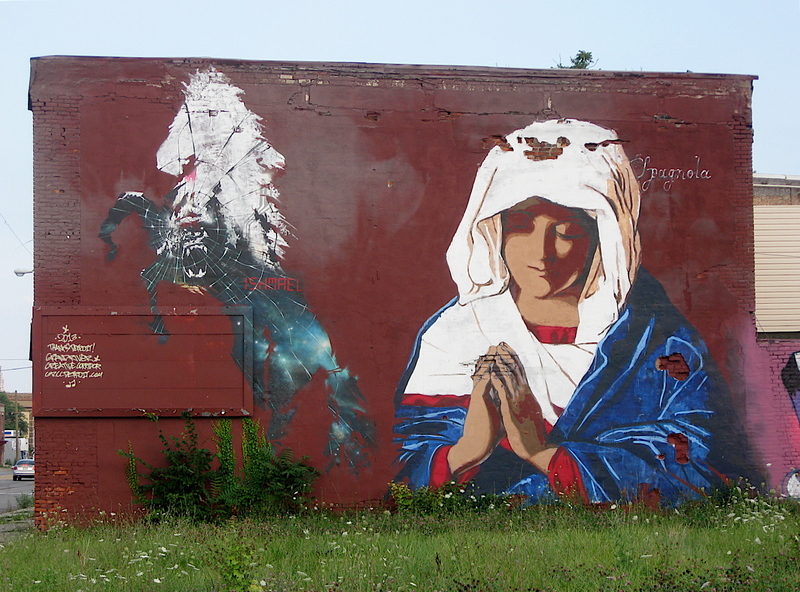 Like other areas of Detroit, it’s a tale of two neighborhoods within its borders. 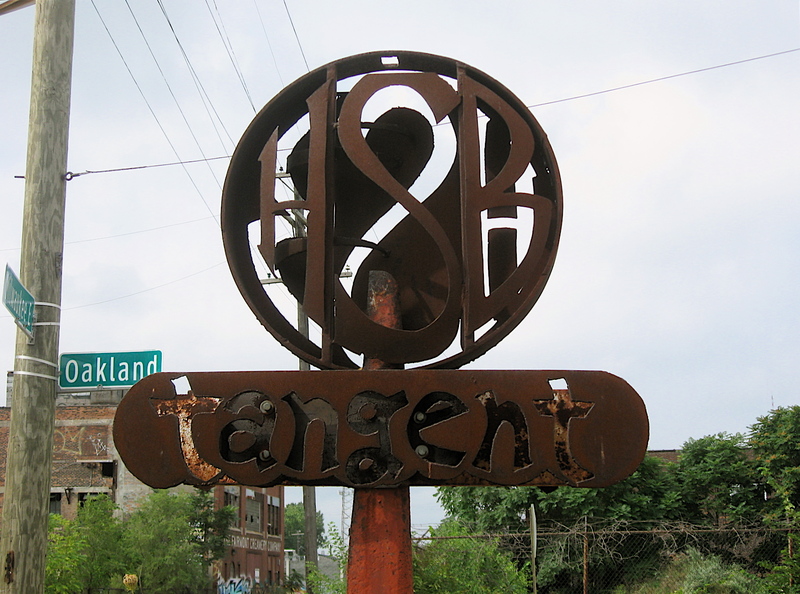 The neighborhood’s south boundary area has a gritty, hard edged, industrial feel to it. 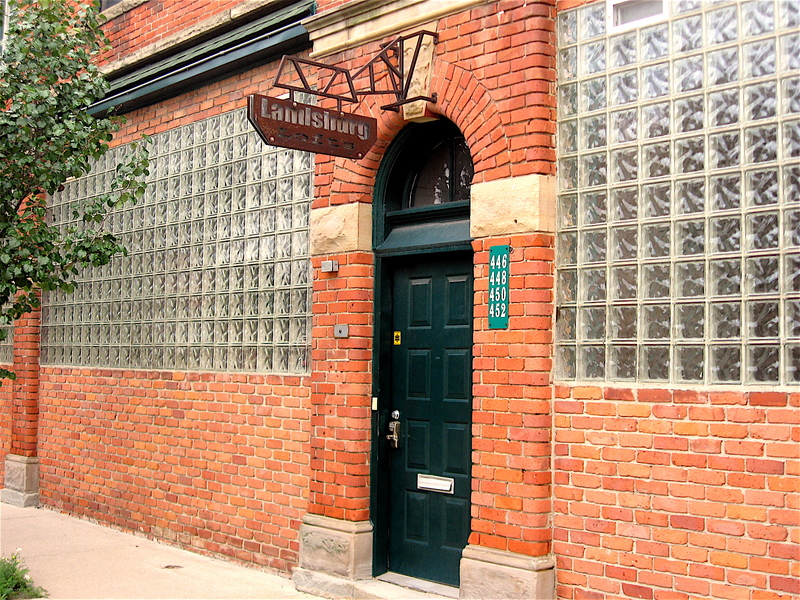 There are expansive brick buildings throughout that were constructed in the 1920’s. Heavy-duty steel structures that support train tracks cut through that section of the neighborhood too. Many of the buildings once housed machine shops that fed parts into the burgeoning auto industry. 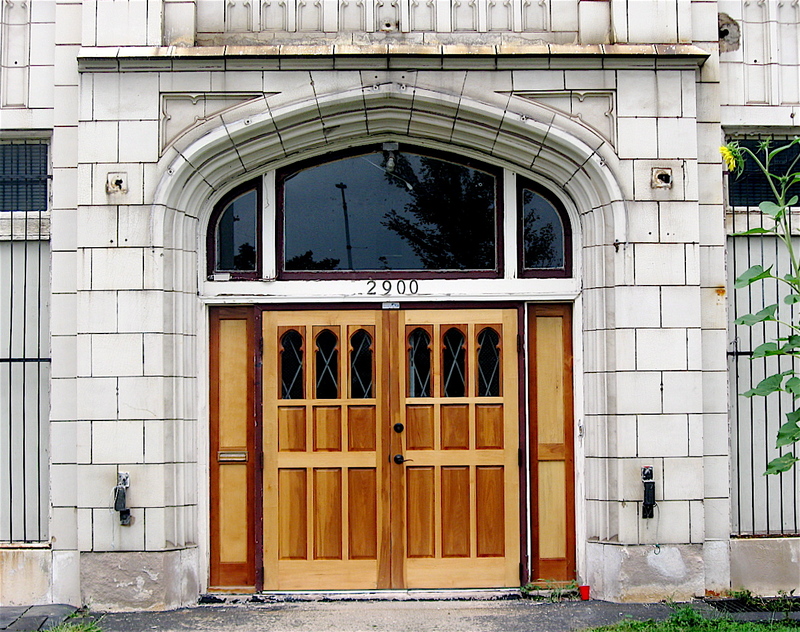 Thankfully, many of those old storied buildings have now taken on a new life. 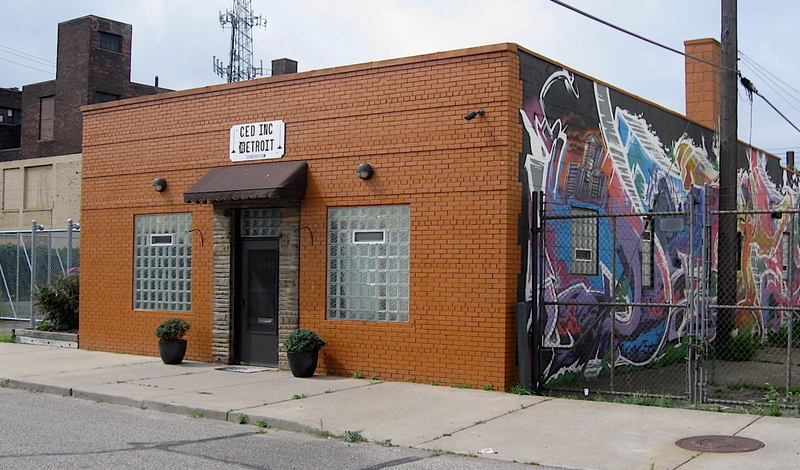 Many of the small manufacturing businesses that have survived the ups and downs of Detroit’s automotive industry over the decades can still be found along the old streets, but change seems to be coming. 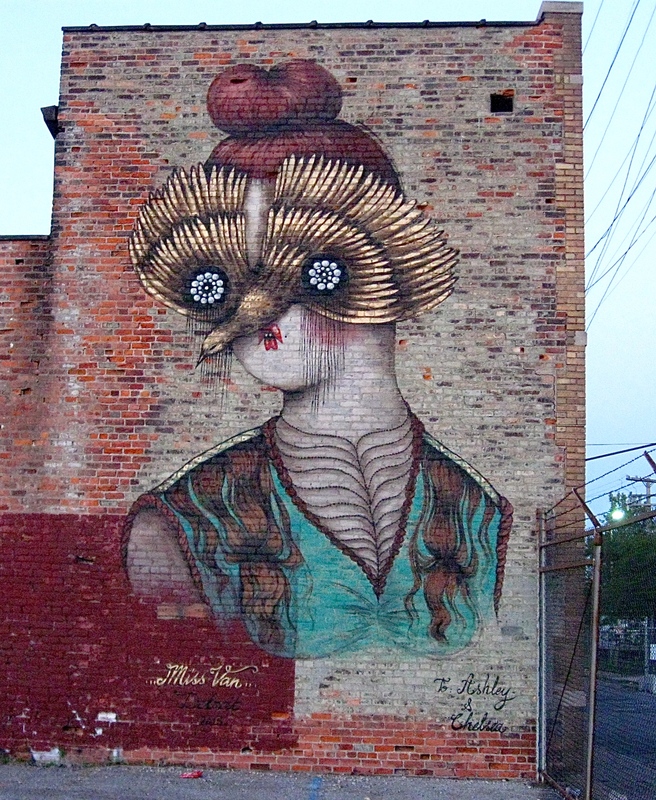 Young artists and others have been converting the vintage brick buildings found along the densely packed, narrow streets into residential lofts, art studios, performance spaces, etc. 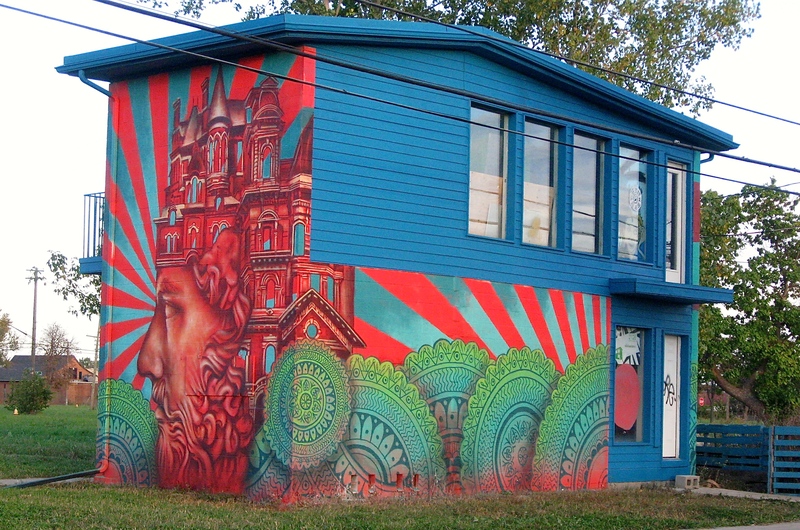 The artists that have moved into the old places on the south side of East Grand Boulevard have created colorful exteriors paintings on the buildings. The large wall paintings seem to glow brightly in the early morning sunrise and late evening sunsets. 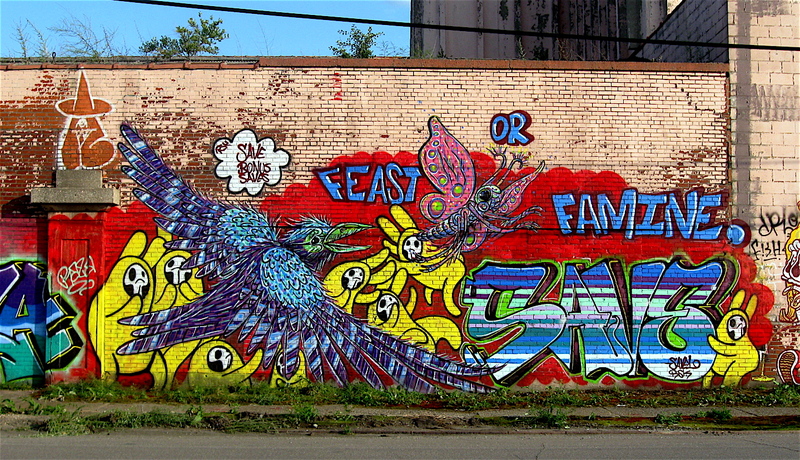 The wall art offers a pleasing, uplifting contrast to the harsh industrial feel in that section of the neighborhood. On the north side of the Boulevard there is virtually no industry. The streets, once lined with homes full of families and viable retail businesses, have changed dramatically over time. With the city’s massive population exodus and other factors, many of the businesses have closed and homes have been abandoned. Now most of the vacant homes and abandoned businesses have been cleared. 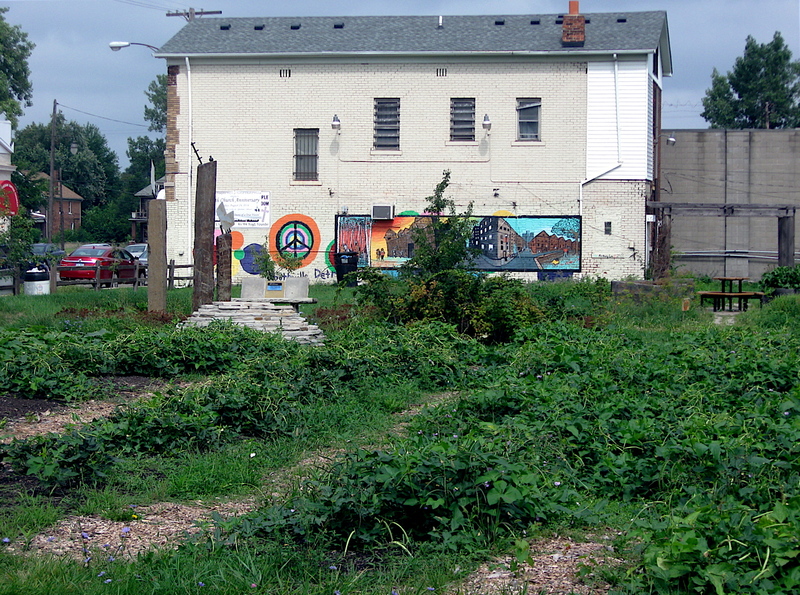 The lots where they once stood are now fields of tall, wild plants turning many sections of the north side of the Boulevard into soothing, country like fields. 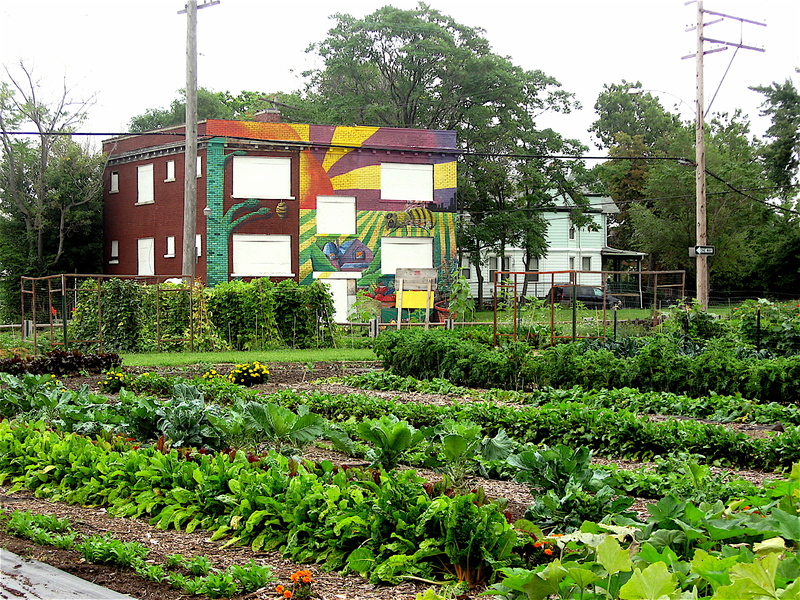 Community and religious organizations have moved into that area and are creating community gardens. Some cover close to a full block of land. 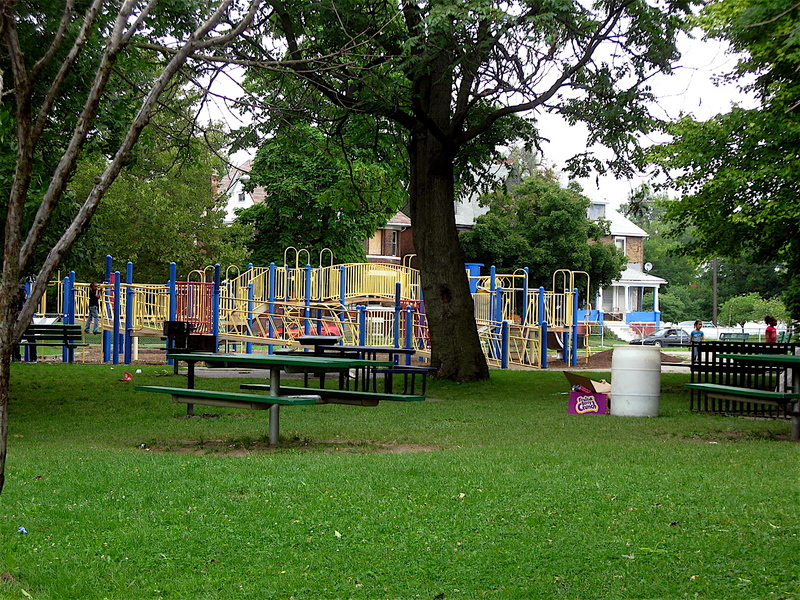 City parks have been adopted and revitalized, and when I recently rode past one, it was in use by families and kids of all ages. The North End is an interesting neighborhood. It offers plenty of diversity in architecture, lifestyles, and landscape. It seems every street I rode down and every corner I approached offered a sense of togetherness and vitality. It’s good to see that the city’s North End is coming back to life. 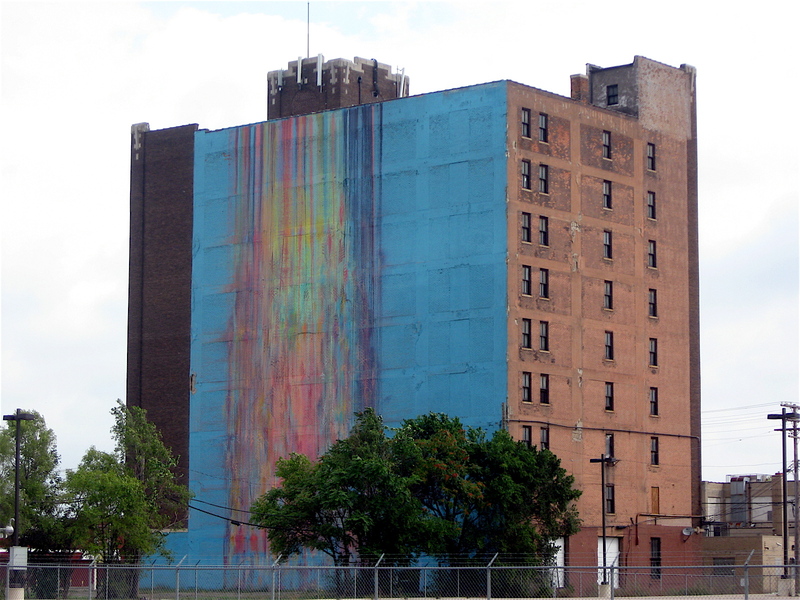 It is no secret that graffiti and wall murals are widespread throughout the city of Detroit. In many ways it makes sense, considering the sheer amount of abandoned buildings with flat walls that seem to span city blocks. There are also plenty of tall railroad and street overpasses with flat, vertical walls. 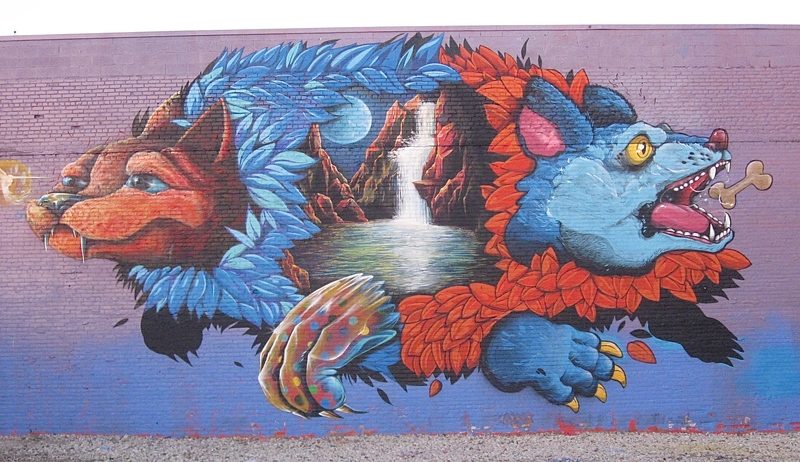 The large, smooth walls make perfect palettes for the artists, and it shows because they have created some of the best street art in the country. 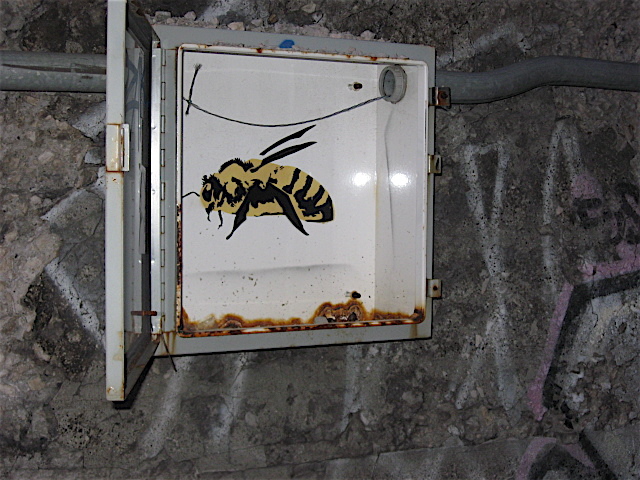 There are other forms of interesting street art that can be found throughout the city in places beyond the underpasses and building walls. 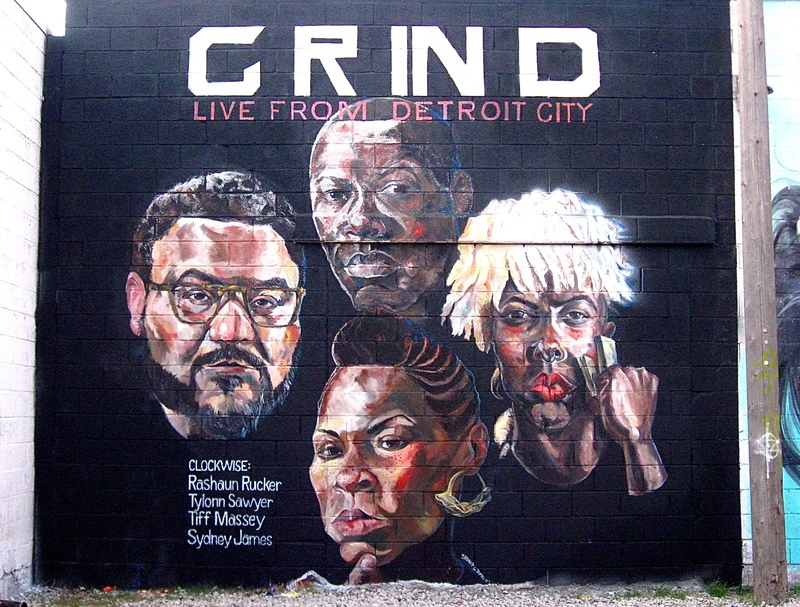 The art can be found almost anywhere, on street signs, bathroom walls, busses, store windows, and plenty of other conspicuous locations including within the many large graffiti galleries scattered across Detroit. 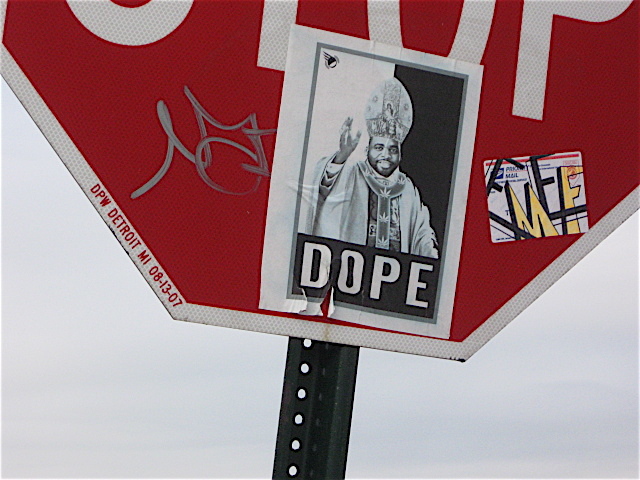 The widespread art medium is stenciling and stickers. Both formats are quick hitting, highly mobile forms of art. 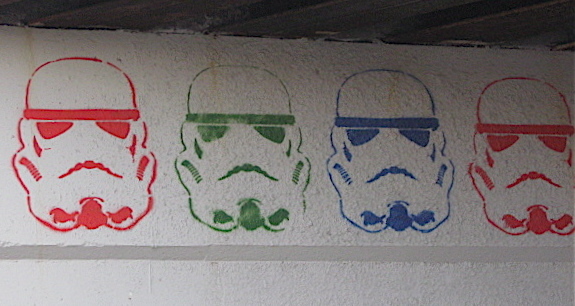 The stenciled art I’ve spotted are usually one color and made of well-designed cut-outs. 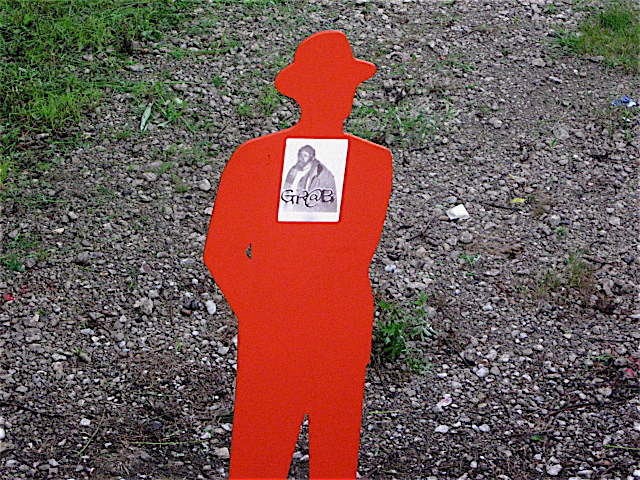 The cut-outs are created from various materials (paper, plastic, etc.) 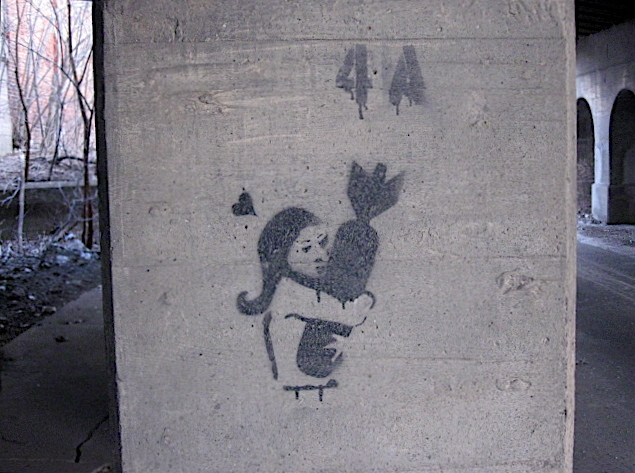 in many sizes and shapes, and are temporarily taped to a wall or other surface. 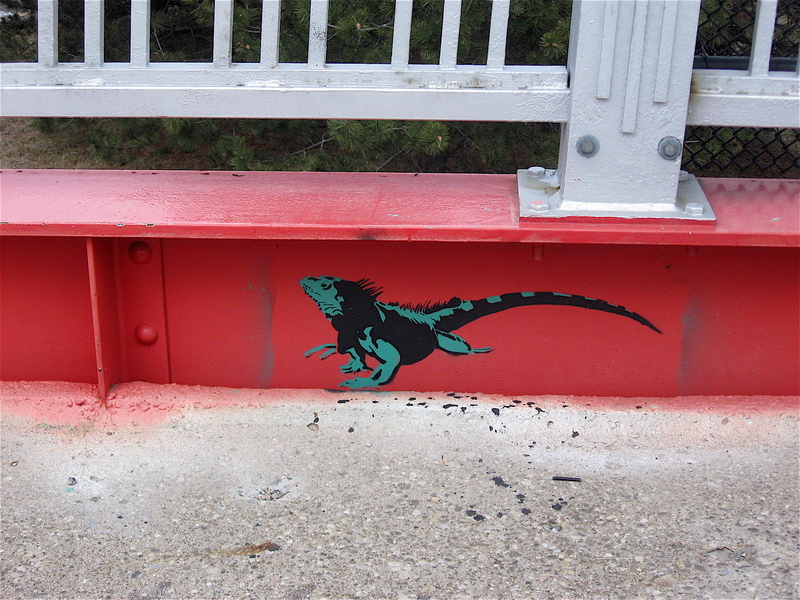 Once attached, the artist quickly spray paints over the stencil then peels it off. What’s left is the image created by the cut-out. 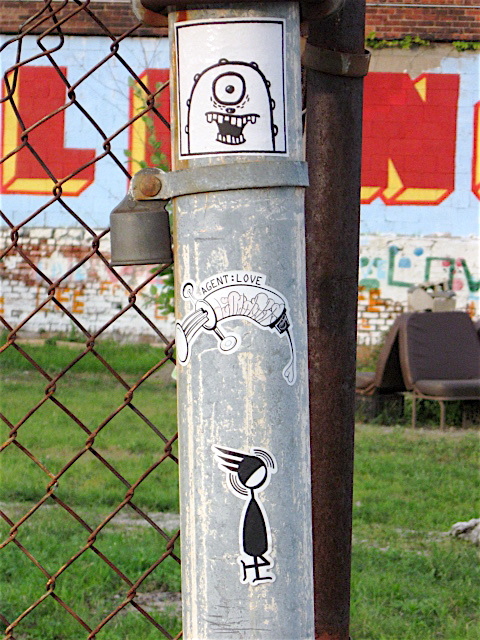 Pre-printed stickers are the quickest type of graffiti for artists and others to spread their message. They are relatively cheap to produce, and easy to carry. Applying them to any surface is fast; just peel and stick. 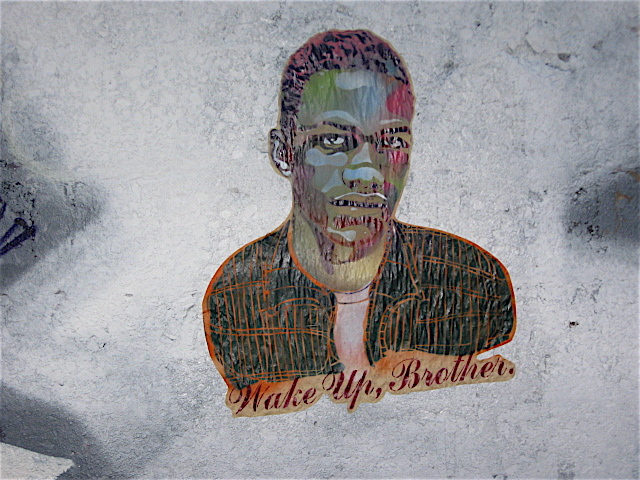 Many are used to promote a political cause while others are used to highlight an artist’s logo, website, or unique colorful image they created in a fast, efficient way. 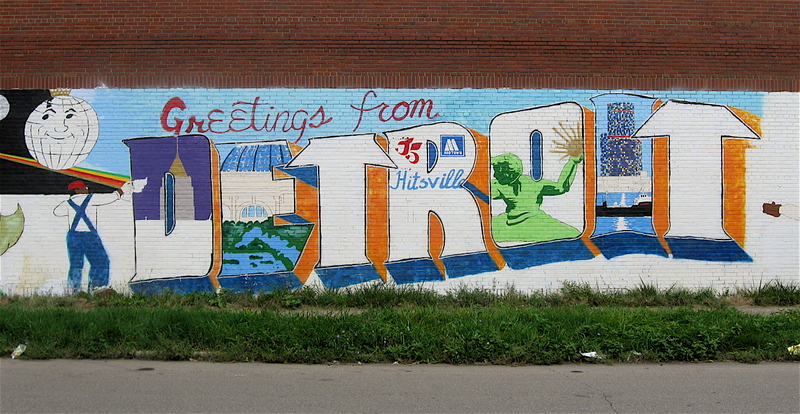 There are plenty of railroad tracks that crisscross the city of Detroit. The long trains carry auto parts, rolls of steel, chemicals, cars from the auto factories, and many other manufactured goods. It’s not unusual to see the trains with two engines chugging along pulling upwards of 100 cars. Judging by the markings and corporate logos on the trains I see rumbling past my front window, they come from all across the country, Canada and Mexico. Riding around this big city on my bicycle, I noticed that most of the train tracks are elevated above the streets and roads. The tracks are held up by huge cement supports that straddle the centerline of the streets below. The arched supports stand at least 13 feet tall. There are also smooth, thick cement walls supporting the overhead tracks that flank the sidewalks, and they run the length of the overpass. 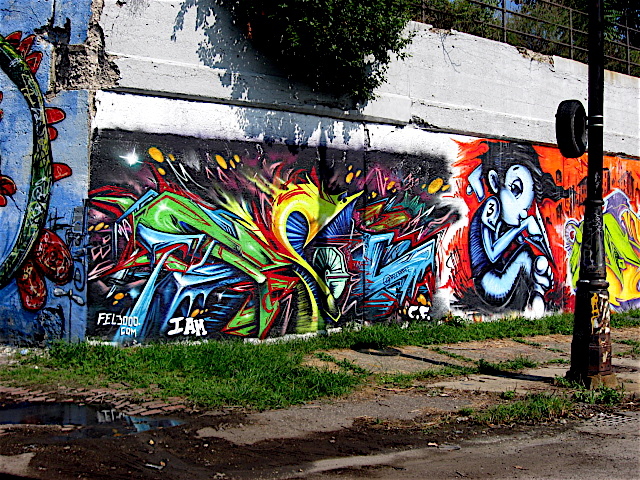 From what I see, the large flat, horizontal gray walls make perfect canvases for graffiti and street artists. 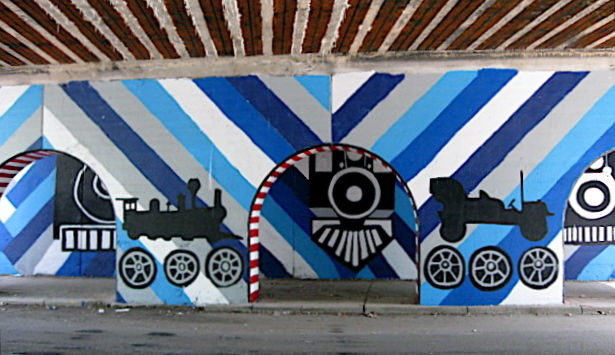 It seems that every railroad underpass I ride through has some sort of graffiti; whether it is quick hitting simple one-color signature tags, large colorful elaborate “burners”, picturesque murals, or other graffiti types. 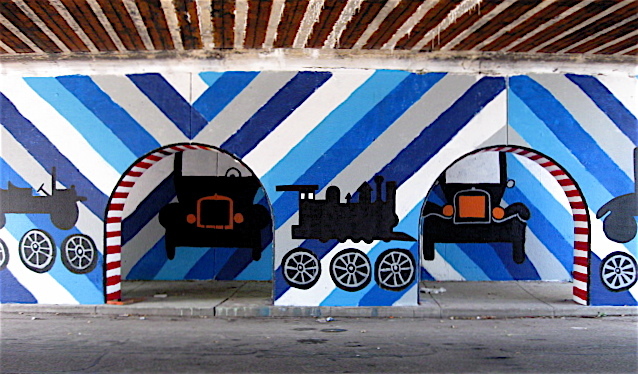 Three underpasses in Detroit’s midtown area have outstanding wall paintings and are worth seeking out for their unique designs and overall artistic execution. 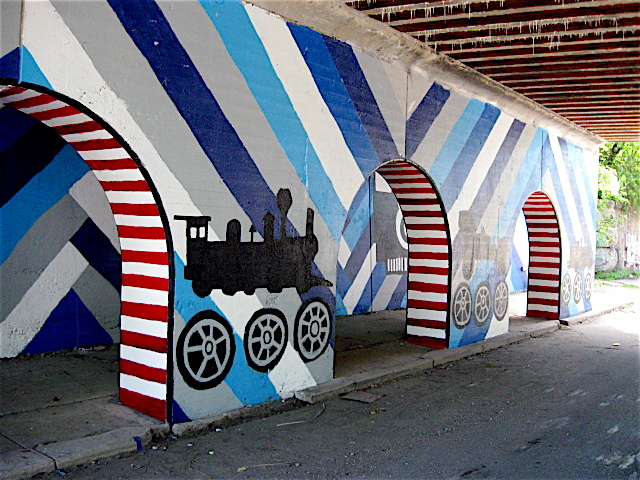 The first is the Trumbull Street underpass just north of I-94. 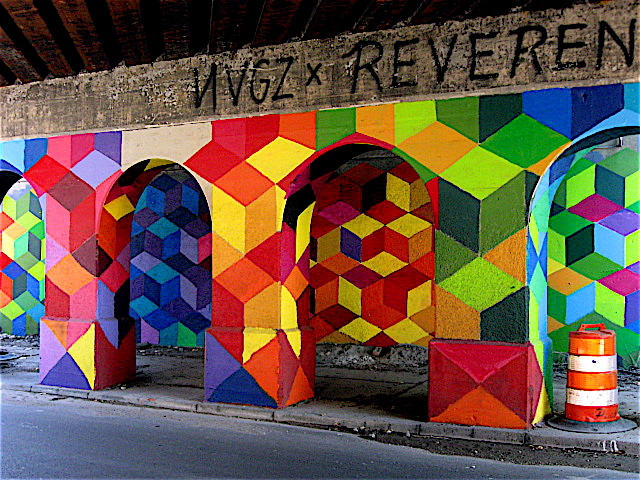 It features a geometric pattern in an endless array of colors. 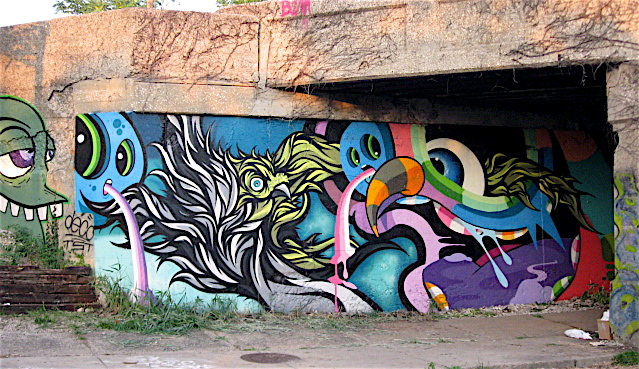 The well-designed, complex wall painting stretches the length of the underpass. The multi-colored, bright design elements are also incorporated on the center supports. The pattern almost looks three-dimensional. One street over from Trumbull is Lincoln. 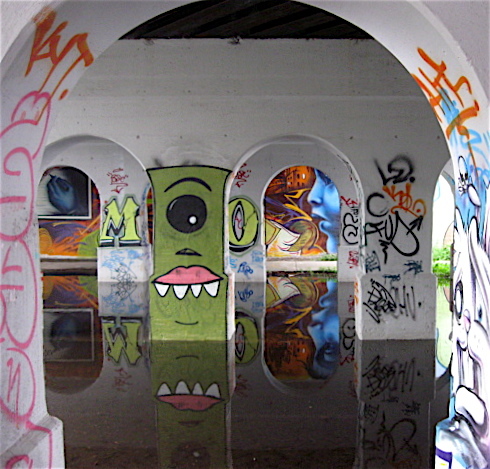 The railroad underpass walls and supports found there are covered in a variety of eye-catching, intricate graffiti art, stunning wall murals, simple tags, and stenciled images. 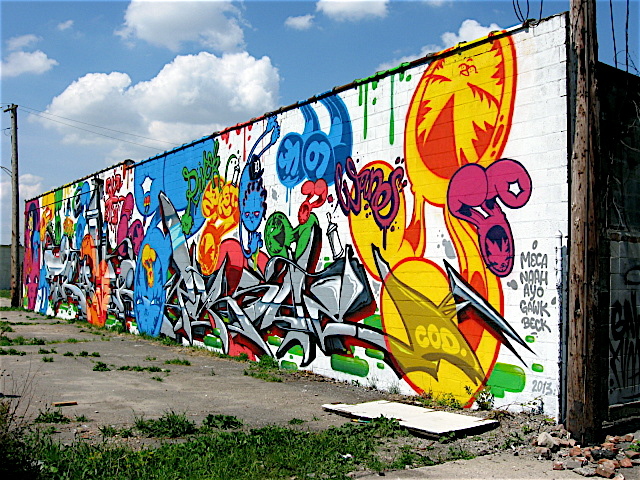 Most have been designed and painted by a number of Detroit’s finest street artists: Malt, Stori, Fel3000ft, Tead, and others. 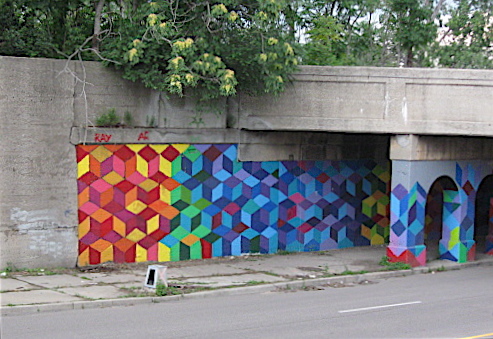 A little further to the northeast is the Beaubien Street underpass. 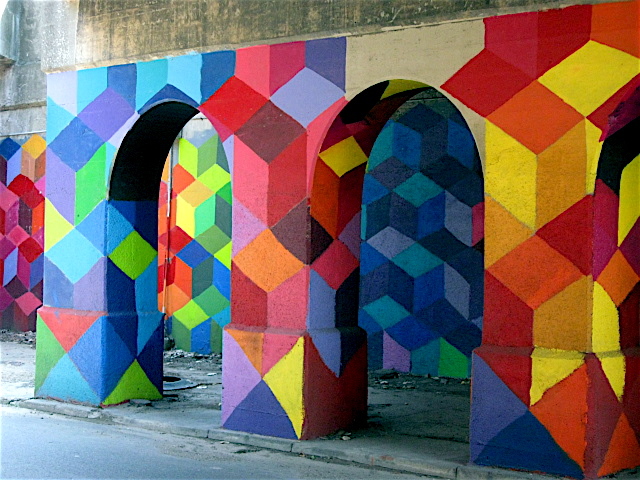 The art there consists of simple colors painted in 45-degree angles, much like a pyramid. 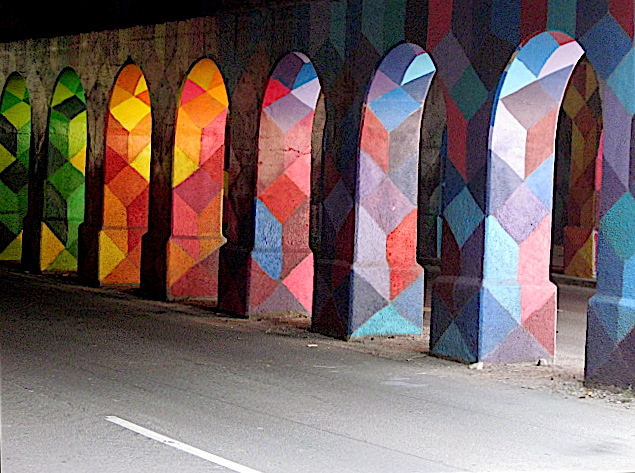 Depending on the wall or support, the V-shaped angles start at street level and rise to the base of the overpass, or they start at the top and cascade down. The inner arches of the center supports feature red and white bars that remind me of piano keys. 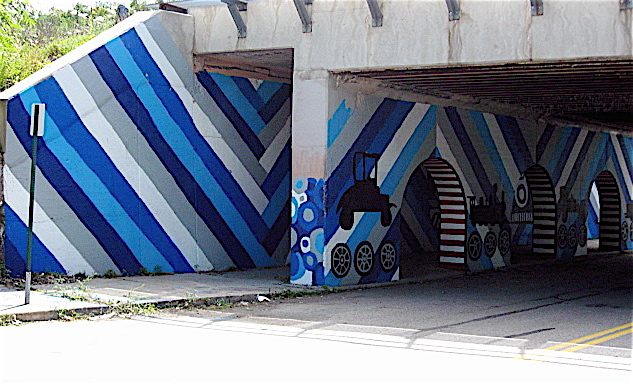 The overall theme of the design on this underpass seems to be transportation. 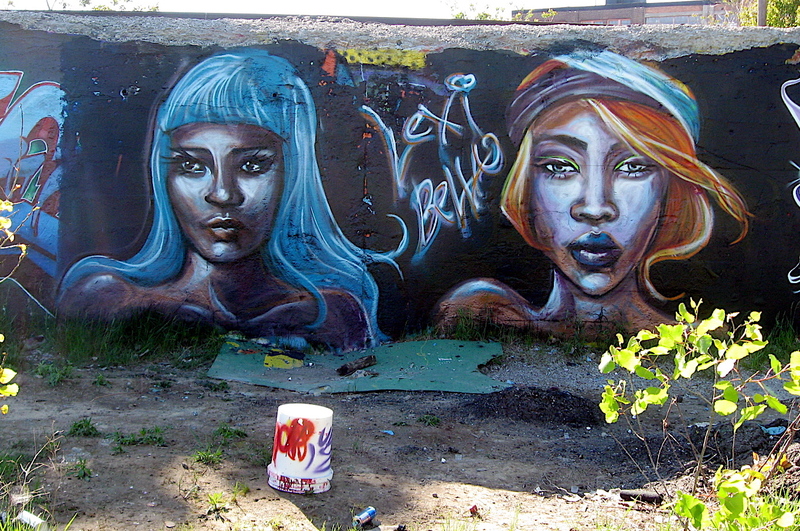 This is just a sampling of some of the amazing art found on the walls of railroad underpasses in the city of Detroit. Take a look the next time you pass through them. 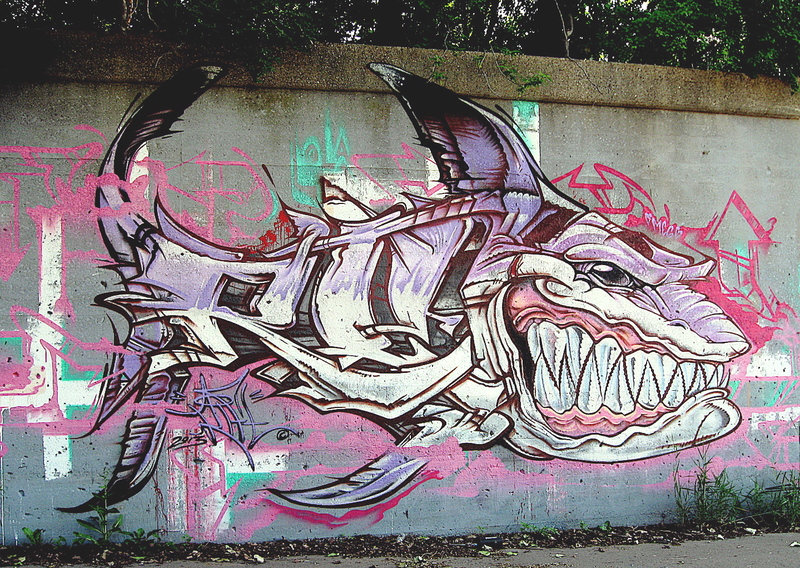 There is a Detroit Graffiti artist that goes by the name of Malt. He is also known as “Brown Bag Detroit”. 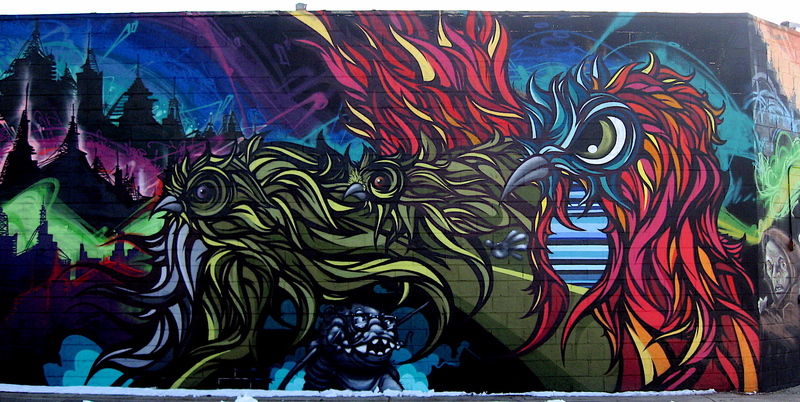 His work is colorfully distinct and somewhat eerie and moody. It consists of mind-blowing forest scenes, owlish characters and unusual birdlike heads with eyes that seem to follow our every move. 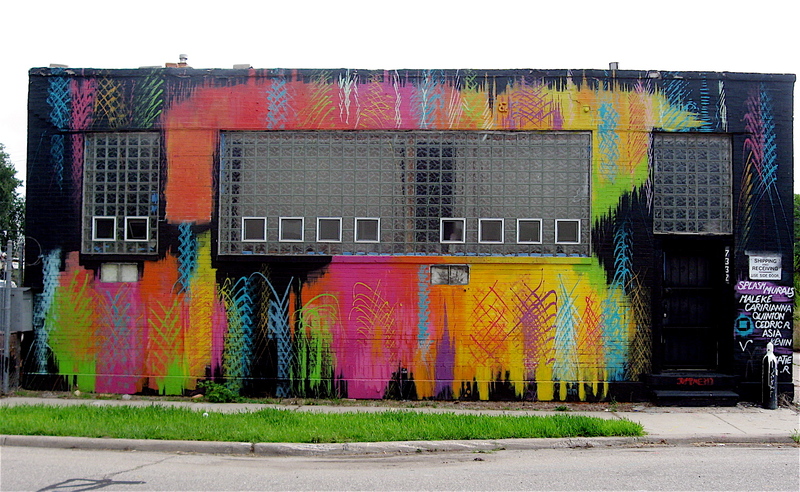 He calls his vibrant work “The Acid Forest”. 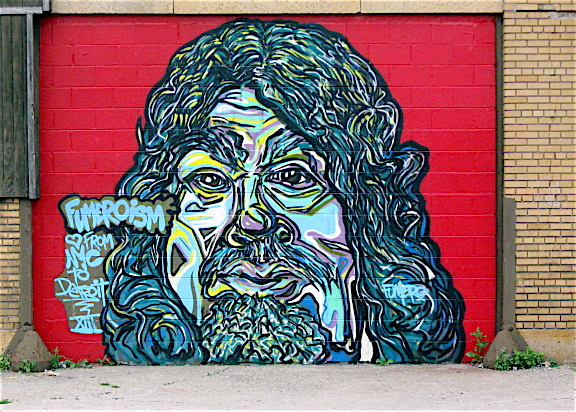 His recognizable work can be found in many of the city’s hot graffiti galleries along Grand River Avenue, downtown’s Dequindre Cut and midtown’s Lincoln Street Art Park. 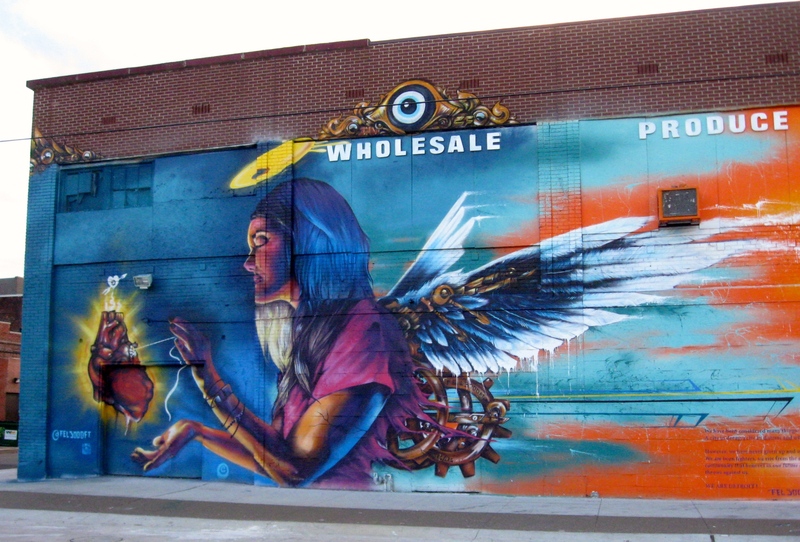 Malt’s large scale wall paintings can also be seen on the “Recycle Here” building just around the corner from the Lincoln Street Art Park. 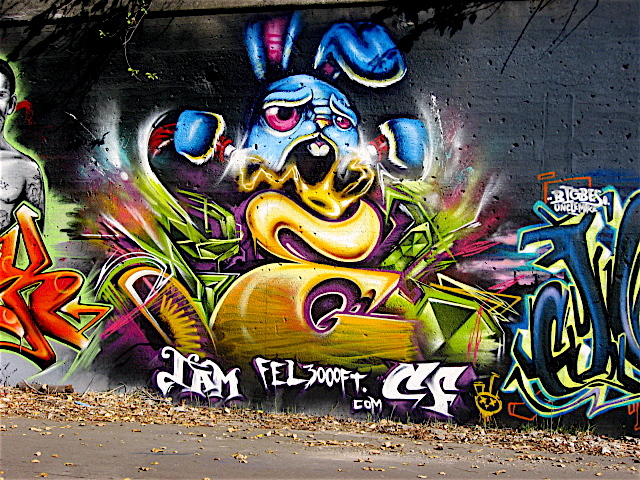 Although I’ve seen his stylized, bubble-letter name spray painted along railroad tracks and elsewhere, his bird-like and owlish paintings are the pieces that really seem to stand out. 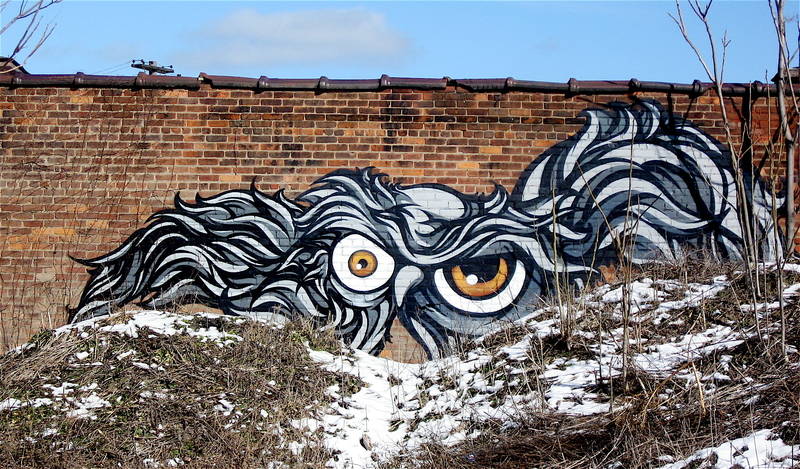 The unusual oversized characters found in the series feature menacing looking big-eyed, hawkish faces on feathered bodies. They, along with his gnarly woodland murals, look like something from an unknown supernatural world, deep within the acid forest. In some cases, the bodies of the strange mythical-looking creatures are entwined in the dark, moody forest as if they’re one in the same, and feature course feathers which remind me of sharp-edged fish scales found on a freshwater carp. 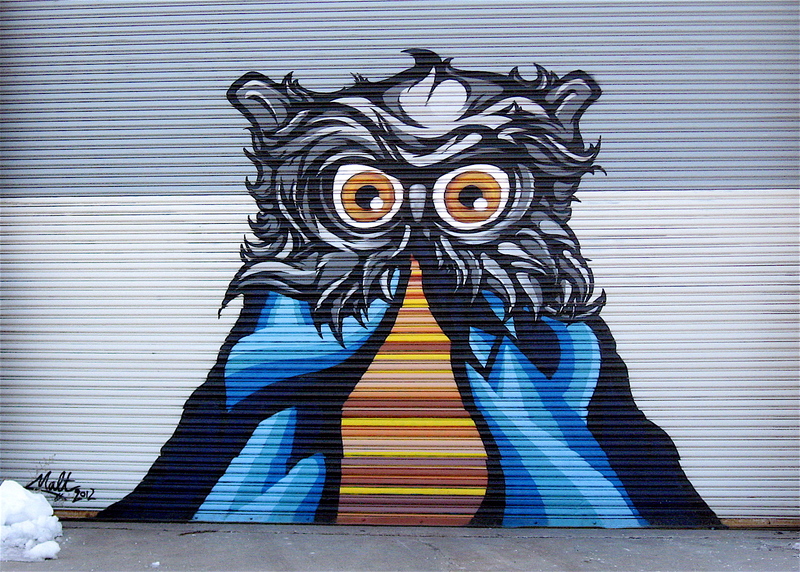 The owls he paints are similar in style, and they too have a certain distinct edge to the feathers. 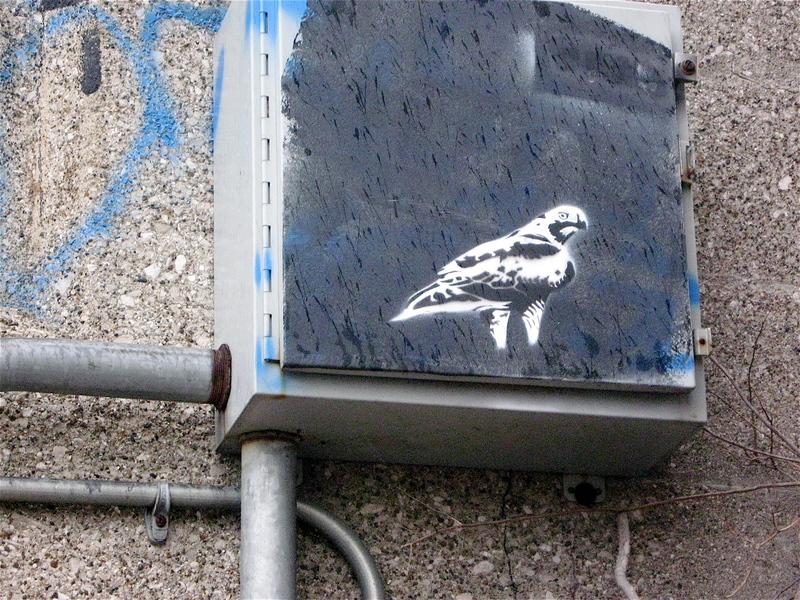 The large nocturnal bird drawings are simple in design, yet engaging. 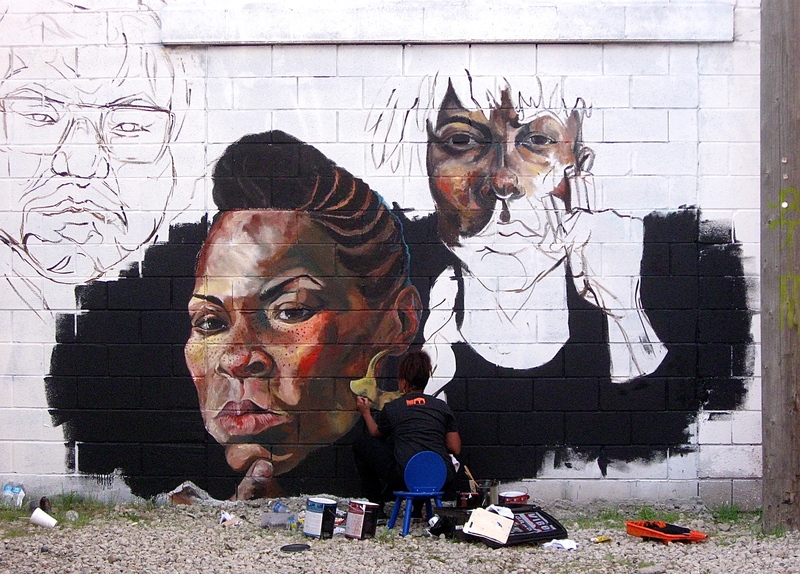 They are painted in earth tone shades with hints of pastel colors and seem to be at ease in their urban environment. They also appear to cast a calming, alluring effect as they look down on us through half-open eyes, much like a mysterious Egyptian cat.